!!! This film is now available on tao films until 30 June 2017 !!! Three months ago, I have moved to Brittany after two pretty depressing years in the north of France. Now that the stressful study time (PhD time) is over, I’m trying to take a lot more time for me and my natural surrounding. My new home is a two to three minute walk away from a canal where you can have a daily walk and watch the ducks making their way to whatever place they would like to go. A five minute walk away is a prairie, a sort of wild place; lots of trees, bushes, birds and even rabbits! If the weather allows it, I’ll make sure to walk through this peaceful place, a place where I can breathe, where I can think or not think, where I can just be. Now, why am I telling you all this, you might wonder. When I walk through the prairie, I’m always thinking of Martynas Kundrotas’ Wanderer, a simple short film about a young wanderer roaming about in nature. I agree, it doesn’t sound like the most spectacular film, and it is, in fact, the least spectacular film I have offered on tao films so far. I have programmed it nevertheless, because I think that Kundrotas’ Wanderer is the closest a slow film comes to what I think some slow film directors want to achieve: bring us, disconnected as we are from our natural surrounding, back to our environment. I believe that we have lost touch with nature. If anything, we think we’re the master of nature, which is also shown in Western painting. I spoke about Chinese painting on this blog before and how Chinese painters painted Man always in a sort of miniature size in order to show that nature is more powerful, more forceful. The size of humans in Western painting is an indication of what we think of ourselves: we’re the crowning glory, we have the power to control nature. Indeed, our relationship to nature is one of control, power and exploitation. We straighten rivers; we hunt animals just for the fun of it; we cut down trees because they’re in our way; we exploit our natural resources in order to live in luxury. If we do walk through a park here and there, it is only to walk through. It’s usually not in order to stop and look at trees, grass, or flowers. Looking at the bark of a tree, for longer than a second, as does Kundrotas’ wanderer, is the opposite of our terribly fast life. We need an adrenaline kick nowadays in order to feel alive, and the bark of a tree is everything but. However, the more time you spend looking, the more you see. There is so much life, a life that runs parallel to others, but a life which we aren’t aware of, because we don’t take the time to become aware of it in the first place. Kundrota’s wanderer roams through fields, touching the grass. He stands at a riverbed in the rain, seemingly enjoying every drop that falls from the sky. While we would open our umbrellas or run for cover, the wanderer remains at one with nature. Water, precious source of life, is something else we merely use without being aware of the meaning of it for us. We have become ignorant, blind, and numb, and Kundrotas attempts to rectify this. Wanderer is not a film that seeks to teach. Rather, in simple, unspectacular frames, the director tries to raise awareness; awareness of what what is around us, awareness of what we no longer see. 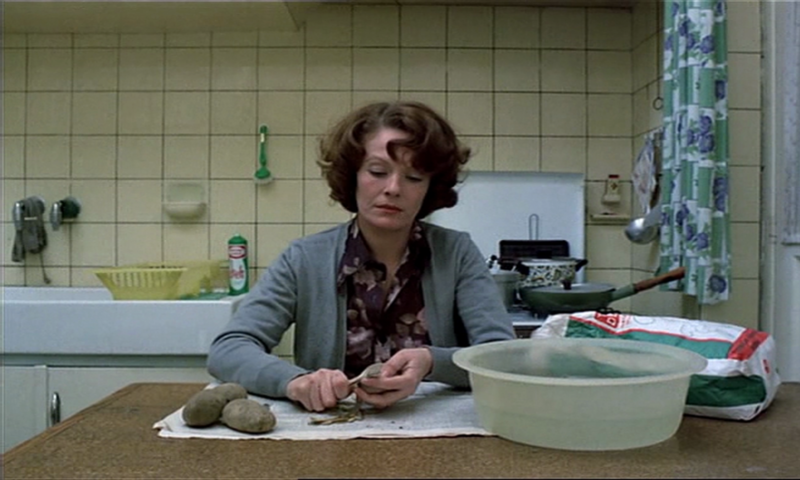 He very much follows Chantal Akerman’s mantra, which I described last week. In order to see, you need to look for longer than a few seconds. Seeing means more than recognising. It means getting to know, it means letting oneself drift off maybe for a chance to learn something new. It is entirely up to you whether you take the journey with the wanderer or whether you dismiss the reality of what nature really is and what it means to us, to our presence, and that, without it, we wouldn’t be here.